Speaking to reporters, Saudi Arabia's Foreign Minister Adel Jubeir said the relations between Saudi Arabia and Russia "have begun to develop and to open up new horizons, which we could not even imagine before." "Relations between Russia and Saudi Arabia have reached "historic momentum," they have become institutional, all government structures are taking part in their development," Jubeir said. Jubeir noted the launch of the investment cooperation between Moscow and Riyadh and continued "intensive consultations" on all relevant issues. In particular, Jubeir noted that Riyadh and Moscow have a mutual desire to boost their cooperation in security and countering terrorism. Speaking on the Syrian peace process, he said that Riyadh supports Russia-backed consultations in Kazakh capital, Astana, adding that Saudis are working closely with Moscow to unite the Syrian opposition. "As for Syria, we are working closely with Russia to unite the Syrian opposition and expand its framework so that we can begin the political process in Geneva," Jubair. A meeting of three platforms of the Syrian opposition — Cairo, Moscow, and Riyadh — was held in August the Saudi capital. The next meeting on the consolidation of the opposition is scheduled for October. During his meeting with the Russian president, Saudi King Salman bin Abdulaziz Al Saud has said the views of Moscow and Riyadh on many regional and international problems coincide. 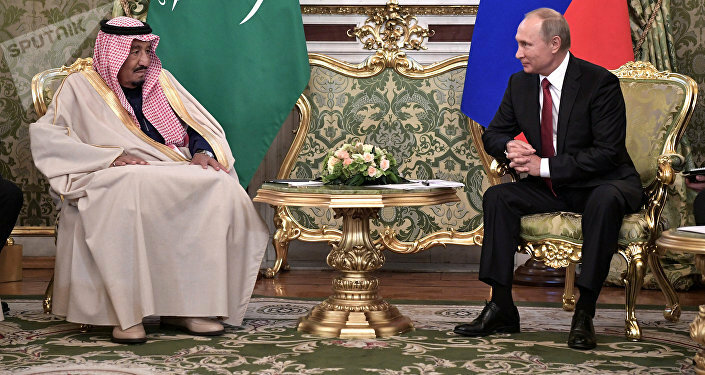 He noted the Russian side's friendly attitude and reaffirmed the mutual desire to strengthen relations between Russia and Saudi Arabia in various spheres.